It's the harmattan (dry season) here in Nigeria and this weather isn't playing. I think it's drier this season than it was in 2016. I find myself consuming more water and still feeling thirsty. The fog and dust that comes with dry season is also here, super annoying! I think the first thing for me is moisturizing my hair. This is the time to ensure you moisturize your hair regularly. At first I got upset at how I'll moisturize my hair in the morning and by evening it would be dry. But then I figured it is because the weather is very dry. So I moisturize morning and night (depending on how my hair feels). I do this consistently because this weather is too dry and my hair porosity is high. The LOC (Liquid, Oil, Cream) method or the LCO (Liquid, Cream, Oil) method helps add and retain moisture to your hair. The Liquid infuses the hair with moisture while the Oil and Cream help seal the moisture into your hair. I use the LOC method. Currently, I use Water (I mixed a few drops of coconut, grapeseed and almond oil with the water), Castor oil and Cantu Leave in Conditioning Repair Cream. 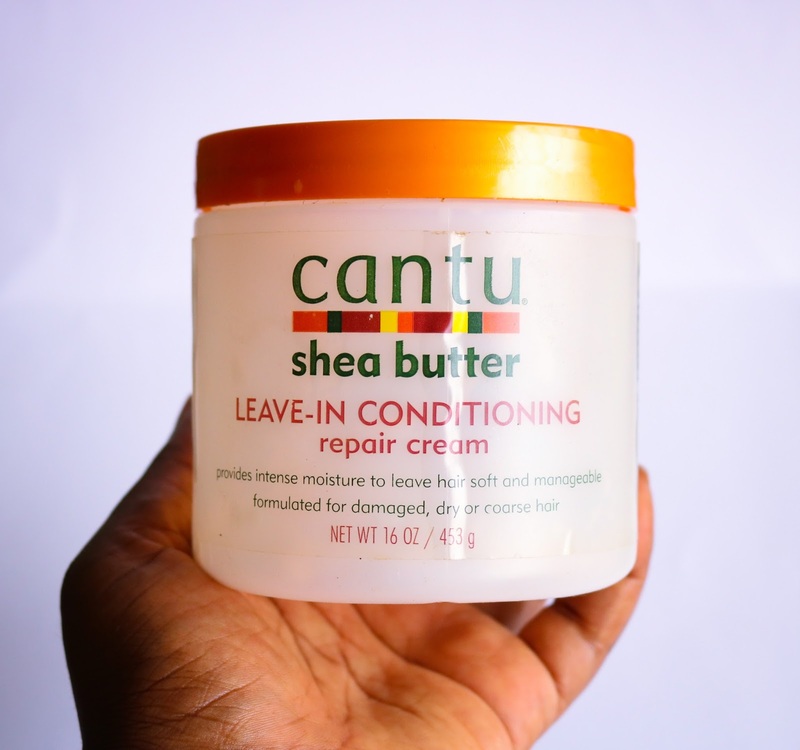 I would sometimes alternate the Cantu leave in cream with my DIY Whipped Shea Butter. The porosity of my hair is high so I find that this works for me. 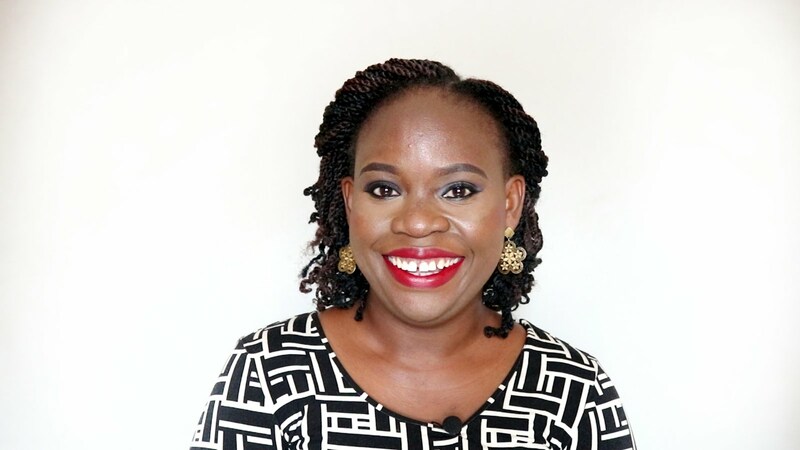 You can check out Kenny Olapade's video on how she moisturizes her dry low porosity hair, click here to watch. And if you don't know your hair porosity, read this post. It helped me figure out mine. It helps the hair retain moisture as it doesn't soak up the products you use on your hair. I use a satin pillowcase and satin scarf but I think it's time I bought a satin bonnet as I'm not so good with the satin scarf (it keeps coming off). 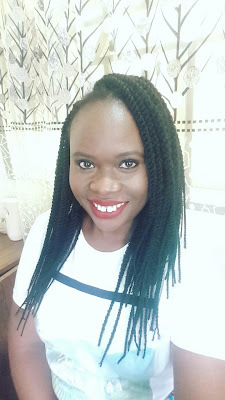 I was chatting with a friend and blogger Afropelo (check out her blog) about how she's taking care of her natural hair this season and she wrote 'deep conditioning every week'. Deep conditioning adds intense moisture to your natural hair. This is the season to do it religiously. Get yourself a good deep conditioner and ensure you deep condition your hair frequently. I'm currently using the Shea Moisture Yucca & Plantain Anti-Breakage Strengthening Masque. This season is the season to Cowash more than using shampoo. Co-washing (short for Conditioner washing) is when you use ONLY a conditioner or a cowash product to wash your hair. Cowashing will gently lift off dirt and product buildup while also adding moisture to my hair. You can use just your conditioner to cowash your hair if you don't have a cowash product. Please note that I shampoo my hair, I just cowash more than I shampoo. When I do shampoo my hair, I make sure I prepoo before I shampoo. I do the Coconut Oil Hair Mask or I prepoo with a mix of carrier and essential oils. It's really good for the hair. You can read all about prepoo here. I put my hair in a protective style. I'm currently rocking twists I made myself after taking out crotchet braids. This is not a time to flaunt your natural hair. It's a time to keep them hidden. If you don't want to do braid your hair with hair attachment or extensions because of the heat, then you can do low manipulation styles like twists, cornrows, bantu knots, roll tuck and pin, etc. The idea is not to manipulate your hair too much and to keep your ends hidden as they are the oldest part of your hair and most likely the easiest part to become dry, weak and break off. This means drinking water frequently. Eating healthy. I really am trying with this. It isn't easy but I know that beautiful hair and skin starts from the inside out. 1. Spritz my hair with water. I own a spray bottle. I mix water with coconut oil, grapeseed oil and almond oil. I shake the bottle and then spritz my hair. Don't leave the water in the bottle too long. 2. I apply Castor oil to my hair. 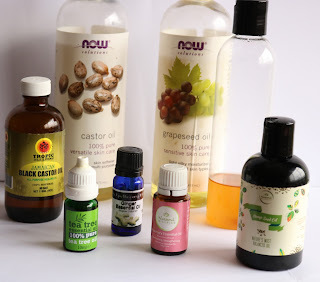 I have the Castor oil in my applicator bottle so I use it to apply the oil and then I massage it into my hair and also ensure the oil gets to my ends. Castor oil is a thick oil and a good sealant and emollient plus it helps facilitate hair growth. Depending on how my hair feels, I may repeat the steps from Morning if my hair feels dry but if it feels okay then I just tie my satin scarf and go to bed on my satin pillowcase. If the scarf comes off, the pillowcase saves the night 😁. If I'm not too tired after work, I will cowash my hair with a cowash product. I use the Cantu Shea Butter for Natural Hair Conditioning Cowash or As I Am Coconut CoWash Cleansing Conditioner or just a regular conditioner. Product I use depends on my mood or what my hand grabs first. I carry a protective style for 2-3 weeks depending on the style. When I uninstall a protective style, I wash my hair with Shampoo and when I do, I make sure I do a Prepoo for 30-45mins with coconut oil or a mix of carrier and essential oils. For deep conditioning, I deep condition my hair before and after a protective style. 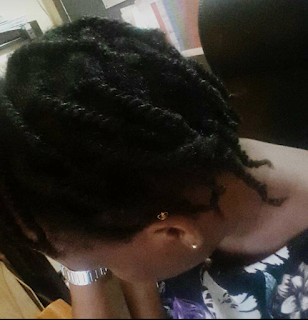 When I noticed how dry the weather was in December, 2017, I installed crotchet braids and had it on from 16th December, 2017 to 9th January 2018 i.e. roughly 3 weeks. I had done a Henna and Fenugreek Hair Mask on 9th December 2017 and then on the 16th December before I installed the braids, I followed up with a deep conditioner I mixed with honey. Honey is good at moisturizing and conditioning hair. When I uninstalled the crotchet braids on the 9th January, 2018, I deep conditioned my hair with the Shea Moisture Yucca & Plantain Anti-Breakage Strengthening Masque and then used Castor oil and Cantu Leave in Conditioning Repair Cream to put my hair in twists. It is important that you know what works for your hair. 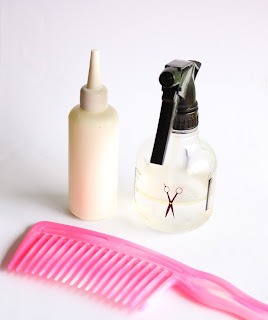 This post is to serve as a guide for you and help you figure out what you can do to help prevent your hair from breakage this dry season. 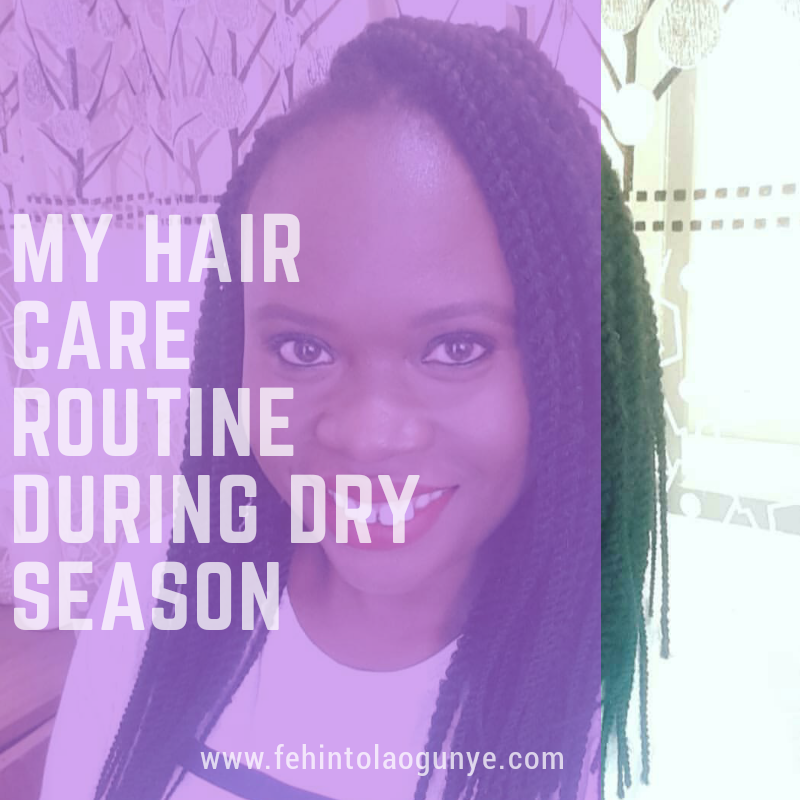 How are you taking care of your hair this dry season? Share with me and other readers in the comments? I hope my routine helps you. If you have any questions, please leave them in the comments and I'll answer them as best as I can. Subscribe to my mailing list: http://eepurl.com/cCaizX. IT'S FREE and I won't spam you, I promise. Nice haircare routine, lol. Thanks a lot. Wawu. Your routine is very detailed. For lazy folks like me, I sealed the hair under protective styling. I really can't handle the dryness if my hair were out. I want my hair to grow and so I'm taking care of it like a baby. LOL! Thanks for reading. Cheers! I'll pay more attention to my hair this year. Thanks for this amazing tips! Hey dear, why did you stop prepoo? Was it to reduce your wash time?